Bands may come and go, but melodic death metal (much like the rest of the genre) stands forever tall. In fact, it’s the bringing in of new talent and bands trying to improve upon the classic sounds that make the genre continue to intrigue. One such new act is that of French act Aephanemer, who first emerged back in 2014 with an instrumental release spearheaded by Martin Hamiche, who performed all instruments. But sometimes one-man acts lead into other things, and Aephanemer 2016 is now a full-band, and they have a full-length album already to show for it. 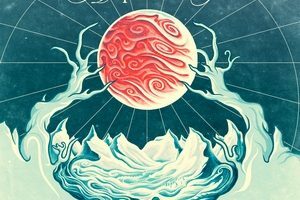 Memento Mori takes everything one can enjoy about melodic death metal – soaring melodies, killer riffs, and suitably gruff vocals (with a clean here and there) – and give it their own twist. A strong debut effort, leading to the firing off of some questions to mainman Hamiche to further devolve some details of this act that seems full of potential. Dead Rhetoric: Aephanemer’s first release was instrumental – how did the evolution occur to a full-fledged band for Memento Mori? Martin Hamiche: Well it has been pretty straight-forward! After the release of Know Thyself in 2014, I decided to turn Aephanemer into a full band to make the project evolve in a natural way. Marion, Mickaël and Anthony joined the band, and we rehearsed a lot to give a few gigs as a full-band. As for the songwriting process, I would say that nothing really changed for me. I wrote songs for Memento Mori pretty much like I wrote Know Thyself songs a few years before. The main novelty is the presence of vocals, so I regularly showed my ideas to Marion and we discussed about it, about what they inspired to her and which lyrical direction we could take! Dead Rhetoric: Given that the first release, Know Thyself, was basically a one-man show, would you ever consider revisiting it as a full band? Hamiche: Indeed we’re thinking about writing lyrics for the Know Thyself songs, and maybe record them. In fact Marion already wrote lyrics for “Path Of The Wolf” and she sang them during our last show. I think she planned to work on other EP songs after our album release. Of course, if we decide to record these “old tracks with vocals” and release them, it will be a kind of “bonus release” meanwhile our next album. Dead Rhetoric: How did the formation of a full-band affect the sound of Aephanemer? Hamiche: Well I composed the songs alone, but my bandmates improved a few little things on the drums and bass tracks, so I guess the rhythmic parts sound better thanks to them! The addition of vocals also made our music a bit less “lead guitar-driven” to give some room to our singer, but not that much. Dead Rhetoric: What would be your best description of Aephanemer to someone who had not yet heard your music? Hamiche: We are playing Melodic Death Metal influenced by Scandinavian bands, Slavic traditional melodies and classical symphonies. If it sounds good to you, you’d better check our album! Dead Rhetoric: Sometimes metal fans get grumpy with bands using clean vocals. Was it important to make sure that you used them somewhat sparingly, considering the jump already from being instrumental to a full-band? Hamiche: I think we are ourselves among these fans who get grumpy with bands using too many clean vocals haha! Of course there’s no problem with clean vocals, but we prefer growls, so we only used clean vocals when we were 100% sure it would sound better than growls. 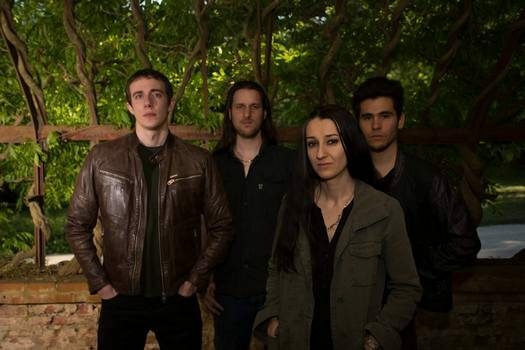 Dead Rhetoric: What led to the signing with Primeval Records? Hamiche: In fact Primeval Records is our own label! We founded it because we like being independent, and today we are not big enough to get an interesting deal from a label. We prefer to keep our freedom and to develop our band ourselves for a couple of years, then we’ll see. Dead Rhetoric: The artwork of Memento Mori (done by Niklas Sundin) is pretty colorful for a melodic death metal record. Could you describe the theme of the art? Hamiche: The theme of the artwork is of course “Memento Mori”, which is a latin expression which means “Remember that you have to die”. With this artwork, we wanted to represent the idea that we are living in a world where life and death coexist: everything lives and then dies a few days, months, or years later. So we wanted to respect a balance between living, colorful and folded, bleak vegetation, which symbolize life and death. Dead Rhetoric: What made you decide to try a band support subscription (available on Bandcamp)? Back in the days people wanted music, and that is why they bought CDs: to access music. Today all the music they could ever want is available for free on the internet, so they don’t want to pay for music anymore. Instead, they are willing to pay for something else: to support an artist, to get a beautiful physical item, to get exclusive content, or to live an experience. As musicians, we have to be aware of this and give them the opportunity to support us, to get beautiful physical items, to get exclusive content, and to live experiences. Ten years ago musicians were expected to provide good music, nowadays musicians are expected to provide a whole universe, and music is only a part of it. I think the triplet (subscription, collector’s boxes, live shows) works pretty well in this context! Dead Rhetoric: Do you think these subscription-based services are the wave of the future for musicians? Hamiche: I think that is a part of the future for musicians. Subscription services are pretty recent and people don’t know how it is working yet, but I think it will get better within the next few years. To me, it is a natural solution to the music industry problem (and a way more natural solution than pushing people to buy CDs whereas nobody listens to CDs anymore, or focusing on streaming and definitely stop paying artists). Dead Rhetoric: Do you have any up-and-coming melodic death metal bands that you enjoy? Hamiche: Indeed : Countless Skies, Aetherian, The Shadeless Emperor, My Hidden Sin and Eternal Storm. These bands are very good! 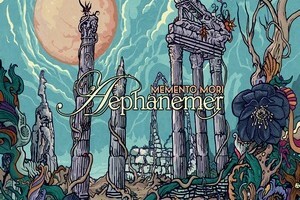 Dead Rhetoric: What’s the rest of this year look like for Aephanemer? Hamiche: Well we’re going to focus on our album release for a while and give several gigs in France, and then probably start writing new songs for our next album! I need to start writing early because I’m a very slow writer haha!